Jordi Gasull – CEO of NameAgency.com. NameAgency is home to a new boutique domain brokerage, founded by Jordi Gasull. Operating from NameAgency.com, the company offers domain name acquisitions, divestment strategies and brokerage services to eclectic clients. DomainGang : Jordi, please share with us some information about your professional background as a domain investor. 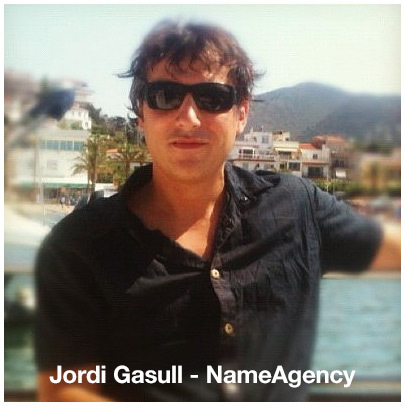 Jordi Gasull, NameAgency : Actually, I come from the music industry as a producer and founder of a record label. When the music industry tanked, I invested in the real estate market. Next that went through a global crisis in 2007-2008. It was then that I became interested in domains, around 2009. Hopefully this industry will let me stick around! At first, a partner and I registered hundreds of domains with the goal of developing and monetizing them. Since we couldn’t develop them all, I began thinking about the possibility of selling some – and I sold some. Once you sell a domain that first time, you can’t stop. From that point on, I began to educate myself about the domain market’s potential – reading through blogs, sales reports, forums, etc. It’s essential to read and learn a lot before investing money in domains. By 2012 I was already dedicating myself full time to domains. At first, I dove into parking, acquiring domains with traffic and high CPC. That went alright, but it turned out to be tedious and time-consuming analyzing all those parameters in order to decide whether a domain would be profitable or not with parking. Now I only spend time buying, selling, and brokering. DomainGang : What was the previous name and function of your brokerage company, and why did you decide to change it? Jordi Gasull, NameAgency : The previous name was Primer Lloc. Horrible, I know. It was the name of the partnership I mentioned earlier – for developing a series of domains. I could write a long apology explaining why I used that terrible name up until now, but let’s leave it as is. That name’s history. DomainGang : How did you arrive to choosing NameAgency as your new brand? Did you acquire the domain in the aftermarket, what was the cost or price range? Jordi Gasull, NameAgency : A domain isn’t just a web address, as I’ve explained to my clients many times. Domains have transcended the online world so that they’re important in the offline world too. Nowadays, they’re part of any serious company’s marketing strategy. A good domain conveys authority, confidence, and credibility simply by mentioning it or seeing it in print. It provides an instant competitive advantage that’s quite difficult to attain by other means. For me, it was important that my arguments and actions be consistent. While choosing the new domain, I was sure that it ought to be 2 words and define what I do. A single-word domain would have been outside my budget, while more than 2 words wouldn’t have been acceptable. Moreover, it had to contain “Domain” or “Name”. The rest of the task was a matter of searching, making lists, discarding and reviewing selections. The winner was NameAgency.com, which is exactly what I was seeking. Luckily it belonged to an Egyptian domainer who had really realistic price expectations, and we reached an agreement right away. As you can see, the domain serves its purpose perfectly because, thanks to the new name, I’m being interviewed by DomaingGang! That’s the effect a good domain has – even without the new website active. We’re working on it; soon it’ll be ready. DomainGang : What types of clients does NameAgency target? Domain investors, corporations, or start-ups? Jordi Gasull, NameAgency : As a broker, 99% of domains are headed for end users: corporations, startups, etc. I also work on confidential domain acquisitions for companies as well as consulting and portfolio management for domain investing. I have a proposal from various investors to create an investment firm managed by NameAgency that would begin this year with starting capital of $5M. Discretion and confidentiality have been, from the start, self-imposed values that my clients appreciate. So I tend not to share too much information about purchases or sales. The domains in my own portfolio follow a diversified strategy: I’ve got liquid domains, brandables, and generics. Generally I buy with end users in mind, except for some liquid domains, which I mostly sell to other domain investors. DomainGang : What is the primary type of domains you currently broker? Short domains? Chips? LLL.com domains ? What TLDs? Jordi Gasull, NameAgency : I’ve learned to say “No”, to set boundaries and requirements for domains I accept as a broker. Currently I focus on .COM domains with a max of 2 words in English or 1 in Spanish, preferably related to products, services, or common generic terms. When it comes to liquid domains, I work with LLL.com, short numerics, and LLLL.com in blocks of 10 or more. I have the advantage of being able to communicate with my clients in Spanish, English, and French – which allows me to cover a good part of the international market. DomainGang : What is your position on the new gTLD market? Are you currently brokering such domain names? Jordi Gasull, NameAgency : I’m a big defender of .COM and am focused on that extension. As a broker, right now I don’t see much demand for other extensions. That doesn’t mean that other extensions won’t work if real sale possibilities exist. In this industry, you cannot be closed off toward any possibility; you’ve got to adapt to changes. DomainGang : Your thoughts on the current state of the domain industry in general, and the future. Jordi Gasull, NameAgency : The domain industry is going through a good time, and it has a great future. But we must be attentive to hints of gradual change, watching how the market will evolve in the coming months and/or years. It’s important to differentiate between 2 coexisting markets and apply different strategies: traditional domaining and the new “liquid” domain market. Traditional domaining is going strong. The dominant extension (.COM) has resisted the specter of the nTLDs; indeed, its position has been reinforced. Now more than ever, domains have become a powerful marketing tool. Premium generics and short domains will continue appreciating as the internet becomes more accessible to more people and more devices. With regard to the liquid domain market, LLL.com and numerics up to 5 digits will hold steadfast. LLLL.com (CHIPs and non-CHIPs) and numerics 6N onward will continue to be of speculative value, with the exception of those that are pronounceable or have some real meaning. Industry players are changing as well. New investors are entering the scene with new objectives and preferences, and they’ll force us to reconsider our strategies. Brokers – the bridge between domain owners and end users, the industry’s principal evangelists, vital for its proper functioning and development – will go through a renovation. Names like Ali Zandi, Giuseppe Graziano, the young Erwan Kina, and myself – who weren’t part of the industry until quite recently – are reconfiguring the traditional broker model. We’re more active on social media (which is where clients are too), forums and blogs. We communicate more, share knowledge, and help one another, eliminating the idea of competition for the benefit of all. We’re eager to make sales, and we use all means at our disposal to reach more buyers and sell more domains more quickly. DomainGang : Many thanks for sharing this insightful information, Jordi. Our best wishes for lots of success with your business. Jordi Gasull, NameAgency : I would like to thank domain investor Joseph Peterson as well; Spanish is my primary language, and he assisted with the polishing of my responses into English. For more information, visit NameAgency.com. Congratulations on the new brand name, Jordi! I remember this sale. $2,600 for NameAgency.com. Great buy, perfect name. Yes, the domain was sold by me (GenericDomainMarket.com). I’m glad you feel that way regarding our transaction.